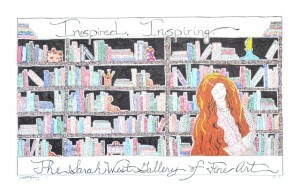 Sarah West is a good friend, as well as a very talented artist and writer. Her gallery, The Sarah West Gallery of Fine Art, is celebrating seven years in business. To commemorate this event, I created this piece based on a photo I took of Sarah in one of her favorite Asheville, NC, book shops, doing one of her favorite pasttimes…reading. Gallery piece — Not for sale.